One chapter and related drawings from Mokgosi’s Pax Kaffraria is on view at Rochester Contemporary Art Center through March 19. Visit MAG and RoCo for the fullest experience of the Mokgosi’s monumental project in Rochester. See six Pax Kaffraria chapters at MAG; one at RoCo. Get the full story. Read Contested territory by Rebecca Rafferty in City Newspaper. Read the article in the DandC written by Robin L. Flanigan here. A public conversation between Meleko Mokgosi and Jonathan Binstock. Mokgosi has received international attention for his finely rendered, mural-sized figurative paintings that explore the complexity of politics, history, and culture in postcolonial southern Africa. He has participated in group shows at the Studio Museum in Harlem, where he was an artist-in-residence, the Hammer Museum at UCLA, and the Lyon Biennale, among others.He lives and works in New York City, where he continues to investigate how national identity influences the way people understand their place in the world. Included in museum admission. Watch Meleko Mokgosi’s “Pax Kaffraria” from CITY Newspaper on Vimeo. Meleko Mokgosi (b. 1981, Botswana) makes figurative paintings that fit together to form “chapters” in large installations that suggest stories or narratives. This exhibition is the first time the chapters of Mokgosi’s project Pax Kaffraria are being exhibited together. The installation at MAG is a rare opportunity to be immersed in an all-consuming pictorial environment. Pax Kaffraria depicts the history of a fictional African nation. It features founding myths and legends of national triumph. An agrarian culture develops into an industrial power and modern society. Flags wave, leaders command, and the pomp and circumstance are televised for viewers who choose to watch the events from the comfort of their homes. There are references to shared values and prosperity—and to attendant threats of possible future decline. Allegories of national lore are present in structure and spirit, but an actual and coherent history of a nation is ultimately impossible to construct from the parts. Upon close viewing and reflection, the details of Mokgosi’s paintings are implausible and confusing. This is a fabricated history. Pax Kaffraria is a complex and enigmatic response to the southern African postcolonial experience, with special focus on the rise of African nationalist movements since the late 1950s. These movements grew out of the struggle of the black people in many African countries for independence from their European colonizers. Sponsored by the Mohn Family Foundation, with additional support from the Robert L. and Mary L. Sproull Fund, Andrew Ainslie and Teri Rueb, Edith Small, Henry L. Thaggert, and an anonymous donor. Meleko Mokgosi has received international attention for his finely rendered, mural-sized figurative paintings that explore the complexity of politics, history, and culture in postcolonial southern Africa. 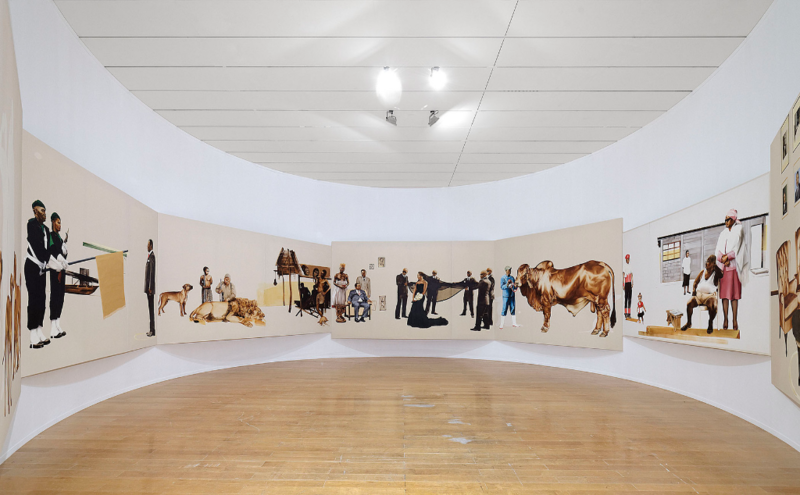 Mokgosi has participated in group shows at the Studio Museum in Harlem, where he was an artist-in-residence, the Hammer Museum at UCLA, and the Lyon Biennale, among others. In 2015 he had solo exhibitions at the Institute of Contemporary Art, Boston, and at Jack Shainman Gallery, The School, Kinderhook, New York. In the fall of 2016 he had his first solo exhibition in New York City at Jack Shainman Gallery. 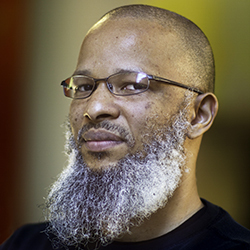 Mokgosi is the recipient of the 2012 Mohn Award from the Hammer Museum. He lives and works in New York City, where he continues to investigate how national identity influences the way people understand their place in the world.